Having spent three decades providing service as a Certified Advanced Rolfer, and working in the field of Alternative and Complementary health care, the leading reason people with pain and limitation seek help, is a drive towards wellness. Human beings are oriented towards a state of functionality and survival. This intuitive drive, or some say an “instinct to be healthy”, moves people towards a desire for optimal function, strength and awareness. It is a part of our evolution as a species as well as our personal challenge in discovering self and living a fulfilling life. I-Stretch & Strengthen grew out of a need to provide my clients with a basic exercise routine as both a part of their rehabilitation and a need for continued development of flexibility and strength. Clients wanted a routine that did not require a gym or equipment, and one that could be used while traveling for business, pleasure and at home. 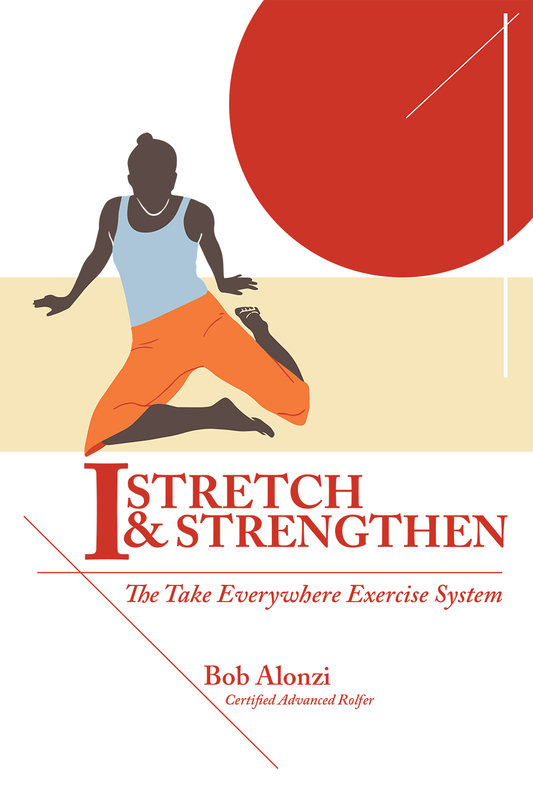 The exercises contained in I-Stretch & Strengthen were first provided individually, and on a need basis, to correct or enhance muscular tone and strength. As time went on I provided groups of these exercise and later the full routine to enable clients to regain flexibility, strength and physical health. As I saw a new found confidence in their physical well being, I encouraged clients to continue the routine and advance it along with more reps and additional exercises using body weight and variations in movement. Clients later moved on to Pilates and plyometric forms of exercise, to advance and take on new challenges such as triathlons, marathons, endurance cycling, dance, martial arts and simple recreation. In addition to improved fitness and health I saw how this exercise routine opened clients to other aspects of self-awareness and change. Clients who never expected to run a marathon or cycle a century did so. And with those accomplishments came introspection and deeper understanding of what it meant to take on a significant challenge and endure the physical stresses of hard work. Confidence and determination grew, as well as a greater understanding of one’s own issues, and the limitations we can structure for ourselves. The negative loop that ran through their thinking of “I can’t run a marathon or cycle 100 miles.” became positive thinking and planning for the next event. What they connected with to get them through the marathon or the century was their determination, preparation and willingness to engage the uncertainty of a physical challenge never experienced. Many of my clients are not athletes who dream of physical challenges. Instead many of them are people who want to reclaim a confidence that they can trust their body’s will stay healthy and allow them to work and play injury free. As I have explained to clients many times, our bodies are designed for a variety of movements and physical challenges. In a way the proverbial “fountain of youth” is found in physical activity and varied movement. There are four basic concepts I believe are essential for physical health: mobility, flexibility, strength and proprioception. Mobility is the proficiency to move the body. Flexibility is a capacity to bend and adapt to positions. Strength is physical power and degrees of intensity. Proprioception is the facility to sense the position and location of the body in time and space. The way I see these concepts for exercise is to understand they all work together to enhance performance and stability. When one of these key factors is missing or minimized there is greater potential for an imbalance in the human structure and less than optimal physical performance. With an imbalance there is a greater likelihood for injury and chronic muscular and skeletal conditions to occur. My clients have told me starting an exercise routine was hard and tiring. But later on, once exercise became a part of their routine, they would describe how good they felt physically and emotionally. Physical activity stimulates a release of neurochemicals that enhance mood. Dopamine, oxytocin, serotonin and endorphins are four of the body’s chemicals that are neurotransmitters that enhance a pleasure response and improved emotional outlook. Exercise helps to reduce stress and tension. Physical activity can help the body relax and improve sleep. And quality sleep is how the body repairs itself and recovers to grow stronger. This brings us to the I-Stretch & Strengthen exercise system. It is the collective experience of the three phases of this system that produces the maximum benefits. As a system of exercise one phase and one exercise build upon the next and the next. The I-Warmup routine prepares the body for what exercises follows. The I-Stretch set improves flexibility, mobility and makes the body more adaptable to accommodate varying kinds of movement and activities. I-Strengthen is the phase whereby challenging muscular capacity enhances strength and proprioception. It is also the phase where the body will produce more neurochemicals, feelings of well being, less discomfort from physical challenges and improved emotional outlook. It often is in the most challenging phase, where the most demands on the body are made, that one experiences a growing awareness of how much of a capacity for hard work one has. Challenging your body to take on new levels of activity is just effort, and an adjustment towards positive thinking, and as many discover satisfaction in accomplishment. Yes...you can do it and gain the health benefits of being physically fit. You can reclaim your body and find confidence and joy in movement, sports and in knowing you are capable of more than you had anticipated.